I’m working on ACLs, so I thought I would write something about them. I’ve come across a lot of good information like Cisco is easy's ACL posts, but I wanted to suppliment and visualize the options available when writing or determining what ACLs are doing. So, this tid bit covers Extended ACLs and the options available to them. I wrote up two examples that I hope explore what Extended ACLs can do. It’s important to bare in mind that there are 3 ways to write the address portions of an ACL. The third is the “any” option which can also be written as “0.0.0.0 255.255.255.255” . This ACL denies everything to the 10.1.1.0/8 network. This essentially blocks all IP traffic. The first example denies the workstation with address 192.168.10.1 access to web services on any server in the 10.1.0.0 /16 subnet. In this case, traffic destined for http (port 80) will get filtered no matter what source port it originates from. The second example is to permit tftp traffic from any host in the 192.160.0.0 /20 network to any server in the 10.1.1.0/24 network. With this ACL I am not only filtering traffic going to port 69, but I’m only allowing that traffic to originate from port 69. Granted this is something you’ll never see, it proves the point of filtering source ports as well as destination. Let's break the ACL down a bit. Then we should have a look at the options available for extended ACLs. Now that we have a good visual representation of the extended ACLs lets see it in action. Here is the simple set up. 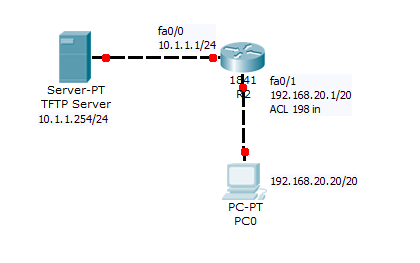 I entered the second extended ACL (example #2, ACL #198) to show the source port filtering option. This ACL is placed on interface fast ethernet 0/1, the interface that the 192.168.20.20/20 network is connected to. It is placed to filter inbound traffic. I tend to think of ACLs as nets on the interface. So, when traffic is coming in it gets caught in the net. Pardon my poor drawing skills. Extended ACLs are to be placed closest to the source. Which to me, makes sense. I would think you would want the traffic to be filtered before your routers have to do any wasted work routing packets that will just get dropped by the ACL. 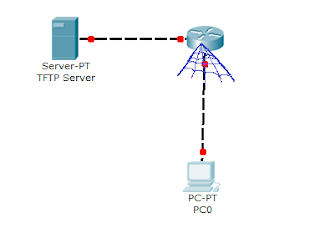 *Note: the packet was dropped at the TFTP server due to the absence of data in the packet. It was sent from a traffic generated and contained no upper layer data. So, it was dropped at the server. 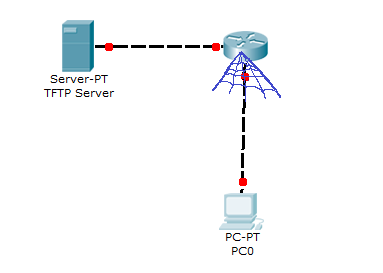 *Note: the receiving port noted is port fa0/1 on the router where the ACL is placed inbound. Hopefully, this sheds some light on the options and ways to write extended ACLs. To supplement this I've added some explanations of what the options are that are available in the ACLs.